"Frances-Anne King's Weight of Water strikes a beautiful balance between mystery and disclosure, bravery and tact, the kind of tact which nonetheless keeps her zeal in place. What underpins the whole collection is not a commonplace 'accessibility', but her dignified restraint; the line is balanced and controlled, the vision never in question. It is a memorable first book." "Memory is central to the poems in Weight of Water, how it is made over; how it surfaces like a subterranean stream; how it is captured in things - a sapphire sky, fingers, the scent of a box hedge. 'I remember' the poet says and we are instantly taken with her - the spell of her precise and lucid images conjuring the strangeness of time or the wistfulness (but never sentimentality) of change and loss or the visceral intensity of colour leaking from the world. The poetry here is fresh and compelling; the poet understands not only what words to use, but what gaps to leave and the result is a poised and impressive pamphlet." of the bone-lit morning light? whitening the light between wind-beats. Chimneys can spend a life-time plotting your destruction. phalanx after phalanx crowding out the skyline. symmetrical and still like textbook diagrams. and terracotta legions - they have their own agenda. "[...] the poems are well ordered and fit together due to a confident and capable poetic voice but with a variety of theme. The book production also shows that a stapled chapbook of 36 pages can be of high quality [...]. 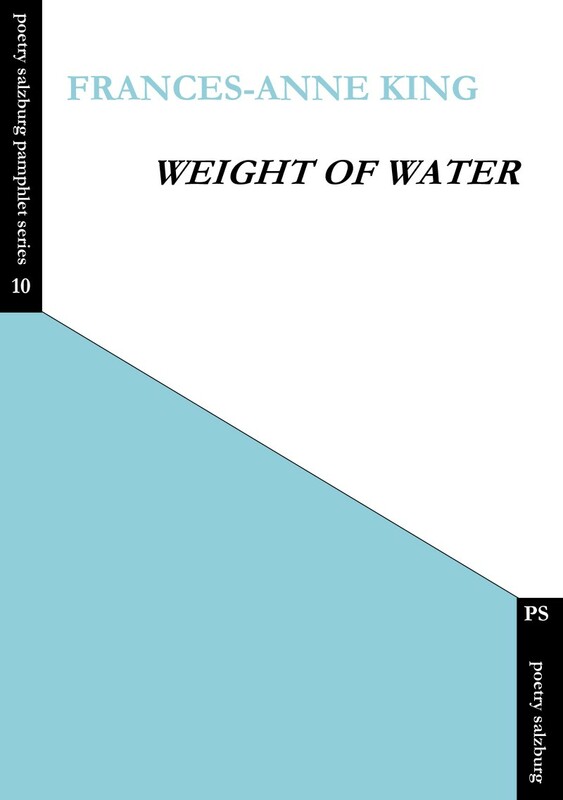 Weight of Water has the haunting atmosphere of poems drawn from memory, sometimes the memory that seems to penetrate objects." Adele Ward, ARTEMISpoetry 12 (May 2014): 30. "Frances-Anne King's 'voice' is captivating - you might think you hear it as softly-spoken, courteous, discreet, tactful; cultured and cultivated. Right - but you'd be wrong if that's all you hear: there's a toughness at the back of it, a tension in the muscles somewhere that puts a real and steely edge on the evocations of memory and human loss, and that nudges the 'nature' poems from mere loveliness into beautifully-managed investigations. [...] Waiting, remembering, noticing, naming - the poet's essential virtues, perhaps? Certainly ones that King cultivates through the exercise of her sensibilities as well as her thematic pre-occupations." "There is a crystallizing of emotion and thought here which reminds one of Imagism in the precision of the lines, but with King's own stamp of originality and exactitude. [...] There is that sense of eternity one finds in Henry Vaughan's poetry, of the binding of life and shadow." W. S. Milne, "The Dedicated Spirit: New Poetry", Agenda 48.1-2 (Spring/Summer 2014): 150-156; 151.